Les éléphants de Nyonié au Gabon 2016 - The African forest elephant (Loxodonta cyclotis). A possibly unknown species of freshwater elephantfish (Mormyridae), a family widespread in West Africa. These fish use their mouthparts to feed on small invertebrates buried in muddy substrates. Above: Tragocephala nobilis, a West African longhorn beetle. 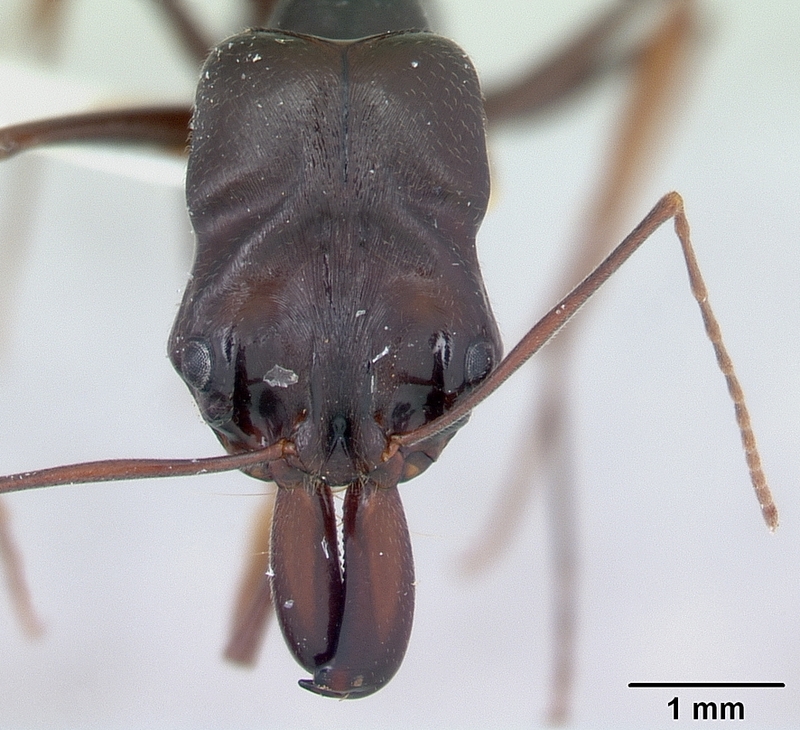 Photos of Cubitermes termite nests found in Cameroon and farther east in the Congo basin. These nests resemble giant mushrooms. A close-up look at the little-known Unicorn Chameleon (Chameleo owenii) of West Africa. A chameleon in the middle of the Ténéré desert. A new, much larger variety of chimpanzee was recently discovered in northern Congo in the Bili region. These chimps walk with their back straight and nest on the ground, unlike other chimpanzees. It's claimed they attack and kill large carnivores for food. This has renewed the debate among scientists about genetic variation among the great apes. It began in the 1860s when explorer Paul Du Chaillu described a hybrid species he called the koola-kamba -- a cross between chimpanzee and gorilla. Above: a chimpanzee photographed by George Grenfell. From: "George Grenfell and the Congo (Vol. 1)" by Sir Harry Johnston, 1908. 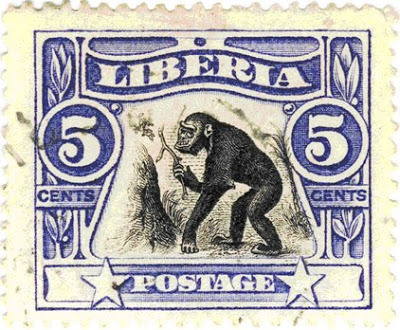 A Liberian postage stamp featuring the koola-kamba. Warning: the eight-inch (20 cm) long polydesmid millipede of West Africa can exude hydrogen cyanide from pores along its body. 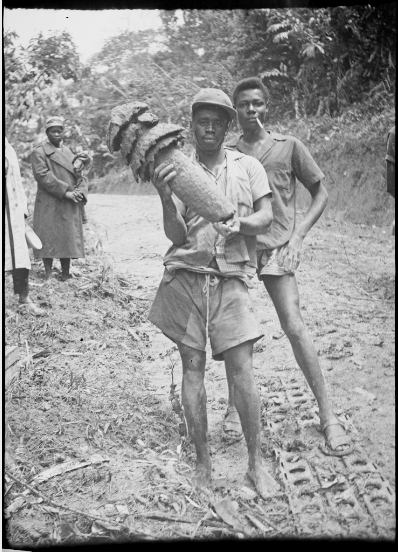 How could we not also mention the giant African centipede? This one was photographed crossing a path near Kindia, Guinea. It's a foot long (30.4 cm). Above: the spectral beauty of Heteroscodra maculata. Below: the Emperor Scorpion (Pandinus imperator) of West Africa reaches a length of nearly 8 inches [20.3 cm]. Despite its size, it is not highly venomous. Above: the Emperor Scorpion (Pandinus imperator) of West Africa. Above: the Emperor Scorpion (Pandinus imperator) fluoresces bright blue in ultraviolet light. Below: the Deathstalker (Leiurus quinquestriatus) is one of the world's most dangerous scorpions. Its neurotoxic venom can cause agony and death by pulmonary edema. 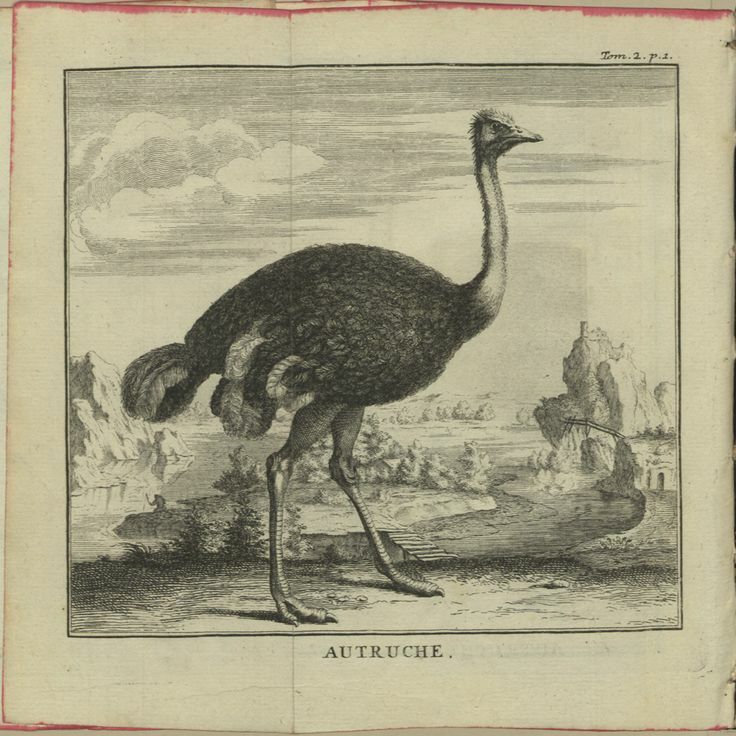 It inhabits desert and scrubland habitats in Mali and arid parts of West Africa, further north to Algeria, particularly Egypt; its range extends to the Middle East. It is aggressive and nervous. The Deathstalker's venom has been found to latch onto cancer cells and make tumors glow brightly. Click below to learn about potential applications in medicine. Below: Goliath beetles can be found in West Africa's tropical forests where they feed primarily on tree sap and fruit. Their weight makes them among the largest insects on Earth. Five species are known. The larvae can reach 10 inches in length [250 mm] and weigh over four ounces [115 grams]. Above: Goliath beetle and mouse. Above: a Goliath beetle larva. Above: the various colorations of Goliathus species, subspecies and forms. Below: the Gaboon viper is also indigenous to West Africa. West African Gaboon Viper (Bitis gabonicus rhinoceros). The Gaboon viper is venomous and has the longest fangs of any snake. In this video it can be seen moving along the forest floor, its typical environment. Below: facts about the West African lion, a subspecies native to the region. Above: virtual recreation of Orthoceras, an extinct marine species that lived in Africa. They grew to 60 feet [18.3 m] in length. This site is published by Paris Alexander Walker of Santa Monica, California. Please send your questions or comments to: alexonthenet1@mail.com.